Thanks for all of your work in researching and posting this. It is nice to know how it works and that I can run the E53 down to empty and not worry about my fuel pump getting hot. You're welcome, I will open up my tank to confirm that '0.0L' and/or DTE 0.0 leaves as suspected approximately 6.6L of fuel. I have a feeling that with the v8 where there is an extra 2L of reserve, they just program the right side sensor to be zero a little higher, maybe exactly the maximum level of the surge tank. UPDATE: so I did get to open up the tank when I was at 1 mile DTE. I siphoned out the gas and weighed it to the gram and determined that the surge tank well holds almost exactly 5L of gas meaning that I have 3.6L of gas remaining once the gauge reads zero the 8L/10L low fuel light is programmed off the 0.0L calculations from the level senders and means the DTE value actually is off by 15-20 miles so you should have no fear in running the tank down to an indicated 0 miles since the extra gallon of gas will keep the pump submerged at any lean angle right down to 0 distance to empty. Last edited by andrewwynn; 03-01-2017 at 11:27 AM. Today is the day! I finally have the tank down to empty. 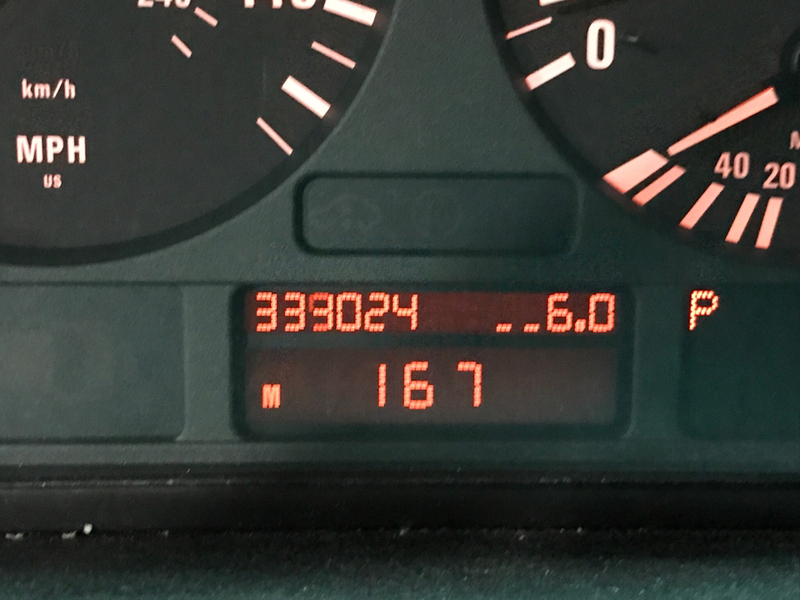 Technically 3 miles to officially empty. It's about 3 miles home so should work perfectly. Notice 00.0 liters left but 1.4 right. That means the reserve tank is full but the left tank is bone dry. Last edited by andrewwynn; 03-01-2017 at 11:28 AM. My money is on that the reserve tank was full when the low fuel warning came on....which should have been when 8 liters displayed in TEST 6 from the right sensor (and the 3.0 M54 engine). But do post back...this is VERY illuminating. Reserve tank full and 6.6L in the left tank still. In other words the reserve tank is not really factored into the fuel gauge or distance to empty. The verbiage online that I have found suggested the 0.0 on test six would be when the light comes on but that is NOT accurate. I'm about to siphon the gas out and measure how much is in there. My test 6 indicates 0.7L remaining which should mean about 6-8 actual liters based on my guess of the size of the reserve tank and that in my wife's car the reserve tank measures 1.4L at overflow. I could be off 50% in my guess of the size of the surge tank and that's why I'm going to measure it. I will of course report my findings. Anybody then can use test six to know exactly how much fuel they have left in their x5. I don't think the tank is different on the 8 cylinder models I think the program is just different when the light comes on (10L vs 8L). The verbiage from BMW suggests that the 8L/10L are the reserve tank amount. That is almost entirely inaccurate. 1.4L of the reserve tank is included in the 8L but whatever is left is not. Every x5 I suspect will have a different baseline right side overflow value (how many liters when the reserve/surge tank overflows to the main tank). 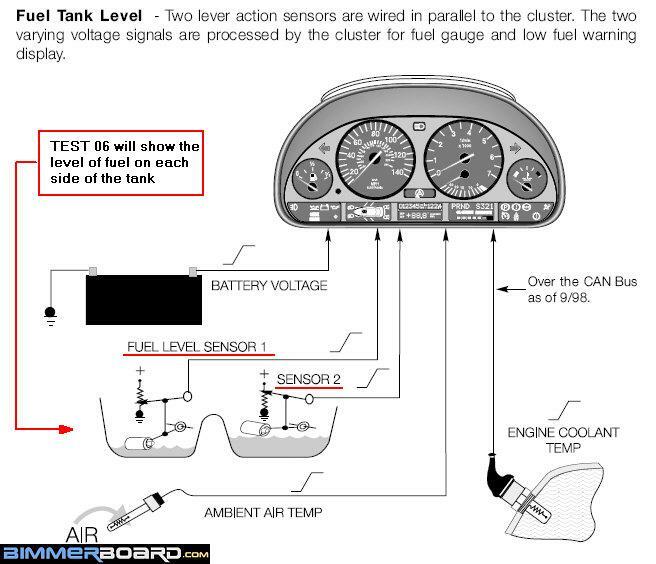 BMW's literature suggests that the surge tank will hold 8/10L but it could be half of that. I plan to find out definitively today. Saga is over. Definitive results! I siphoned out the gas in the reserve tank and weighed it to the gram. The gauge read 0.7 L but there was 4.3L in the tank or 3.6L left at 0.0L or 0 miles dte. That is just shy of a gallon. I would expect about 15 miles of range before the pump may have problems going around corners etc. (after hitting 0 miles to go). Summary: I drove my car down to 1 mile dte and there was just about 1 gallon in the reserve tank. I am far more confident in driving down to single digits. I got down to about 5 miles to empty before the surge tank was no longer spilling into the main tank. In other words until you are down to FIVE MILES to empty there is no functional difference in the fuel supply system. The tank ended up being a little smaller than I thought: I was guessing 6-8L and it turns out the reserve tank is about exactly 5.0L. My right gauge said their was 0.7L when there was 4.3L. The gauge was dialed in to not include the last 3.6L of gas in my case which is perfect: consider that gas like the last bit of stick deodorant, not meant for consumption just to keep the pump submerged down to 0 miles to empty at any angle of road (or un-road). So "now we know". The surge / reserve tank on the e53 is 5L. The car is absolutely unaware that it has a bigger tank once there is less than about 35L of gas according to the gauges as any more than 5L in the reserve tank will simply spill over to the main tank on the left side. 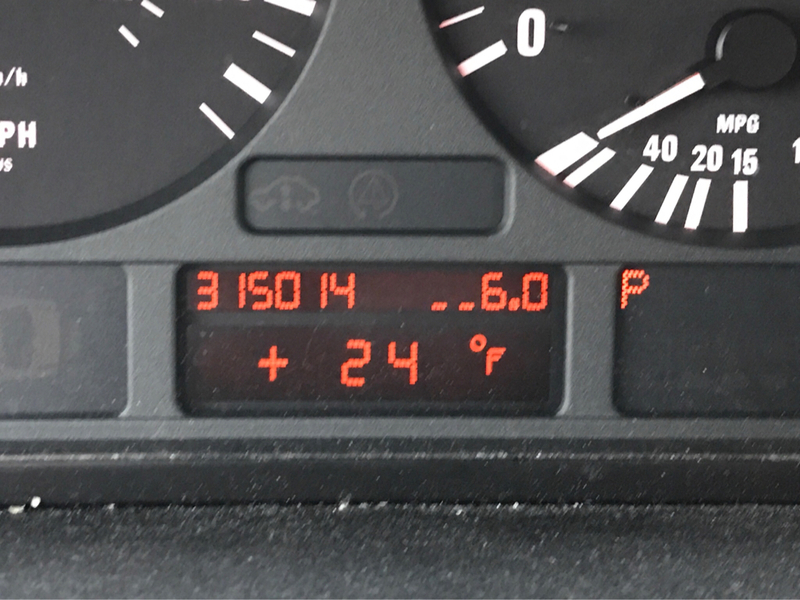 The calibration on my wife's car with the new pump shows 1.4L but every car would likely be different. That said, simple math will tell you what your true reserve is. 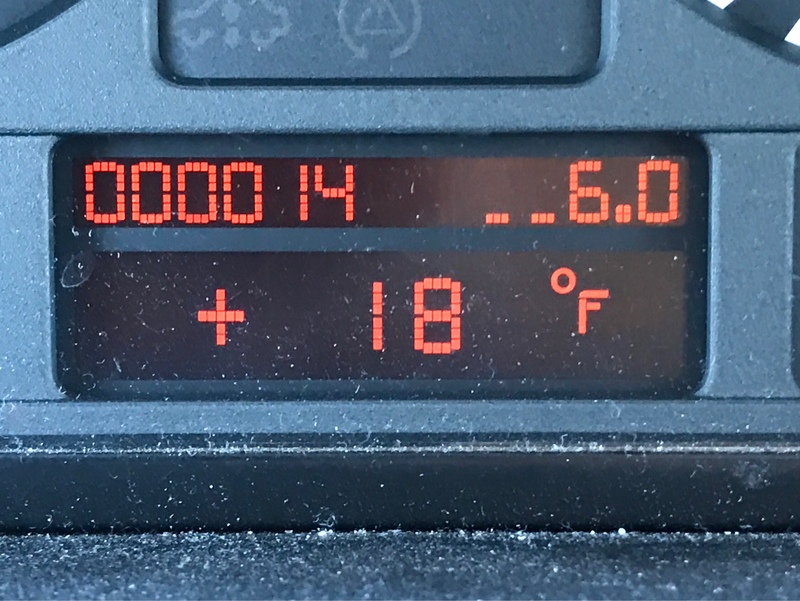 The computer will estimate 0 miles to go at 8L for 6 cylinder and 10L for 8 cylinder models. Last edited by andrewwynn; 02-10-2017 at 10:44 AM. I carefully added fuel a gallon at a time to determine when the left side is full. It was between 9.5 and 10.0 gallons when the left tank finally filled and started flowing over to the right side. The gauge measured about 8.5gal on the left side but I wasn't on level ground. Back to separate left & right tanks and car is operating solely from the reserve tank once the left side is less than about 32L. Example: at first you may have 10 miles DTE and run out of gas, but it will eventually be 80 or 100 miles. Lastly, the ONLY way to test the system is to drive down to zero DTE; it sholud be done periodically maybe annually or twice a year. Last edited by andrewwynn; 02-10-2017 at 11:39 AM. Just by chance and not wishing to pay Chicago prices for premium gas I was able to test the siphon pump once more. There is a station in Evanston that sells premium typically 50-70¢ per gallon less than anywhere in Chicagoland. With full confidence that I wouldn't starve the engine I drove down to 14 miles to go so I could save maybe $12-14 on a single fill up. $14 will net me about 5 gallons and therefore nearly 100 miles on the freeway! I've gone down to the low 20's miles to empty a couple of times to achieve a similar cost saving top off goal. Your research has encouraged me to be a little more fearless if I have to go down to these low range numbers and has greatly improved my understanding of the E53 fuel system.